Kids can never seem to get enough of classic googly wiggle eyes! Hysterical massive glow-in-the-dark giant wiggle eyes turn almost anything into a hilarious gag, crafting embellishments, Halloween Ghost Monster or Christmas Snowman decoration. These BIG googly eyes are just like their smaller counterparts, only enormously larger, and they glow in the dark! Monsters, clowns and other crazy creatures come to life with this pair of large EERIE GHOSTLY GREEN wiggle eyes. High quality DARICE brand Jumbo Glowing Googly Eyes can also comfort kids by illuminating light switches, dark corners and other things they may need to find in the night. Awesome Giant Eyes are charged by exposing to direct bright light and then glow in the dark. No batteries required! A black light will also give them an extra eerie glow! Giant funny swirling glow-in-the-dark wiggle googly eyes. Classic round shape brings any inanimate object to life, for loads of creepy Halloween party fun or funny gag any time. 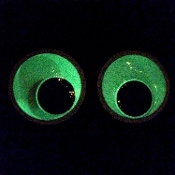 ONE PAIR of Giant Glow-in-the-Dark Plastic Googly Eyes. Turn out the lights to see these giant eyes glow! The perfect decoration for your glow party or other themed event, these big googly eyes will have everyone's sights set high. Use to decorate trees, mailboxes and more! *Needs exposure to bright light first. Place These Extra-Large Google Wiggle Eyes out during the daylight hours to absorb bright light, or place directly under bright lamp light for a few minutes to force a quicker glow. Enjoy as you watch the eyes start to glow when darkness falls!